What’s scarier than angry ghosts? At the Manila Film Center, a group of psychics and mediums find out. I can’t believe it took me two years to pick up this book from Mt TBR. 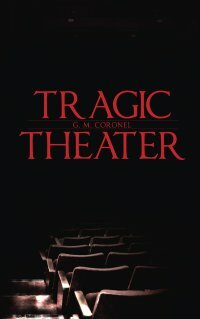 On the title page, the author’s signature reminded me that I bought Tragic Theater at the Manila Book Fair of 2009. All I needed was a moment, to decide to pick it up, to flip to the first few pages, to be completely caught in a night of exorcism that took place at the Manila Film Center in 1999. This iconic structure was notorious since the beginning. 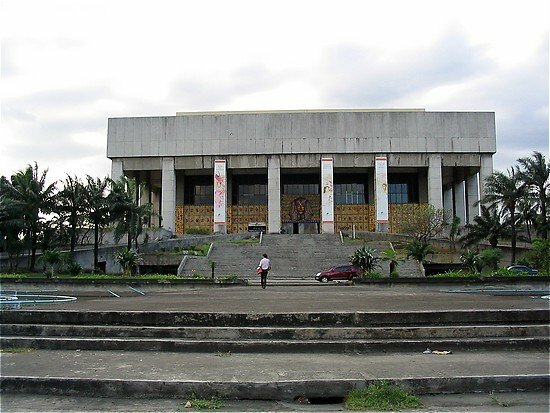 Inaugurated in 1982 to a star-studded International Film Festival with then First Lady Imelda Marcos reigning over the event, the structure failed in subsequent years to live up to its promise. Reports of haunting and a series of bad luck followed the building and any activity held there. The government lost money. The first festival, grand as it was, cost more to produce than it made money. Why was the structure bad luck? Why did security guards regularly hear mysterious voices and sounds of construction work at night? Why did some moviegoers witness ghostly apparitions in the restrooms? Why did government employees feared staying late? Were there poltergeist activities? Maybe the paranormal cloud was the result of the tragic accident during construction, and ruthless decision that followed it, leaving 150 workers dead? The tragedy was a matter of public record. On November 17, 1981, at 2.30 am, a scaffolding with six giant beams collapsed and crashed to the main theater area. Officially, there were seven dead. If based on popular belief, the number would be closer to 150. Supposedly, the first lady ordered the halt of rescue operations only after several days so construction will resume. They had a deadline to follow, after all. Workers were buried alive in cement, their pleas for mercy ignored. Their tortured souls developed a hate for the living. With this backdrop, Tragic Theater came on stage. The new government wanted to build an Imax Theater inside the structure. But first, ghosts had to be driven out. It fell to Annie, dedicated Tourism official, to make this happen. She requested Reverend Nilo with his radical methods of supernatural cleansing to take on the Manila Film Center. Big job, but an attractive challenge for ghostbusters, thought the Reverend. That and he cannot say no to Annie delivered him and his group of psychics and mediums to the film center’s doorsteps. What he and Annie did not foresee was that there were more terrifying things inside the structure than angry ghosts, and that their own tragic histories would make them extremely vulnerable to these forces’ influence. According to the author’s brief bio, his literary background consisted simply of a genuine love of reading and love of writing. His writing shows this, relatively free of literary pretensions, straightforward, making straight for the action. The story reads like the reality-type horror movies so popular now. The prayers and rituals were probably lifted from an exorcist’s manual. In terms of character development, only Annie and Reverend Nilo benefited–which is fine by me as the story did not need the personal histories of the others in the group to progress. I’m not so sure though about the Tagalog dialogue with English translation on several pages. I think it just ate up space, and I skimmed the Tagalog for the English. No big deal, just noting it here. Manila Film Center: Haunted by angry ghosts and something else? In terms of horror, I rate it 3.5 out of 5–until I reached the last chapter and realized things were not as straightforward after all, and goosebumps rose on my arms and the air became decidedly chilly despite the humidity. My rating rose to 4.5, short of perfection only because I wanted to hurl the book on the wall because it won’t, can’t answer my questions: What?! Why?! What was the message?! Who was it?! Photo of Manila Film Center taken from here. Click to read review of Tomb Keeper the sequel. This seems to be a pretty interesting read since I’m really interested in ghost stories. But the way I feel now, distracted by the mystery, I want the solution now or I can’t work! Let’s trade spooky stories next time we see each other! Yes, and let’s do it on the steps before the Manila Film Center! Part of me wants to read this book and another part (the more rational one) wants to stay far, far away! Hi, dementedchris! Be crazy and read it. You can finish it in one seating. Bagay na bagay for Halloween *evil smile*. I think this would be a great for a book discussion. We can have it on the steps of the film center. Whatchu think? We can set it for next year, but that’s too far away. Why not hold another unofficial discussion… on the steps of the Manila Film Center as you said. Oooh, scary! Let’s do it!!!!! You like, on Halloween or closest date possible? The book is very thin, people can finish reading in an hour. Yay my sister bought that book kanina and I saw your blogpost, wish I had the scariest time reading the book. Hey, read it now. It’s midnight! Haha I think my sister won’t borrow me her books after she done reading them. So I’ll wait na lang muna. I can certainly understand that, :P. I hate cliffhangers, too. But I get suckered into having to find out what happens next each time! I can’t help it. That’s why I have such a big TBR because I am addicted to buying series. Hi, waistline32. You can find the books at local bookstores like National and Fully Booked. Let me know what you think of the book after you’ve read it. Tomb Keeper (prequel and sequel to Tragic Theater) is now out in the market. Wow, I will look for it! Thanks for letting me know.